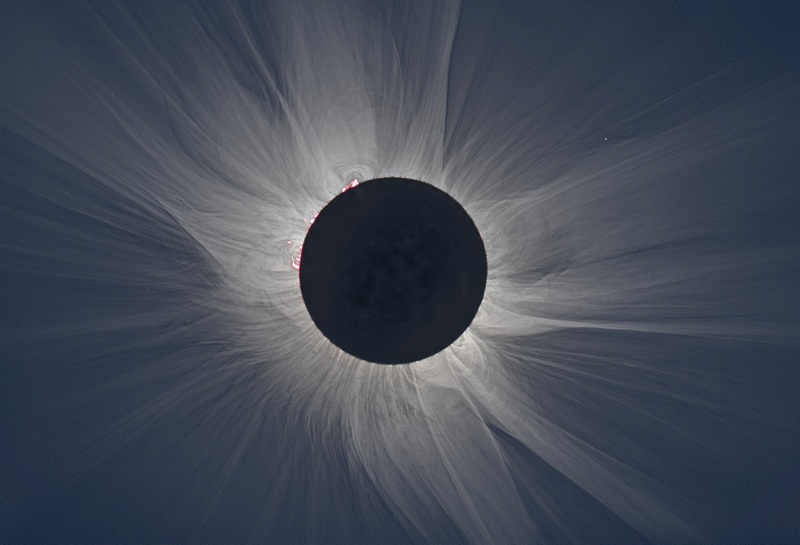 A white light image of the Sun’s corona during totality of a total solar eclipse. As you all know, on Monday, August 21, 2017, a total solar eclipse will sweep across the continent, with the path of totality, some 70 miles across, crossing from Oregon to South Carolina. My friend and astronomer Phil Plait has written a super article that comes in two parts, and you can find the first here. (Update: the second blog post is up, and can be found here). Map showing the path of totality, as well as areas that will get to see a partial eclipse. The Great American Eclipse is a fantastic opportunity for millions of people to view an eclipse. I encourage you all to do your best to get as close to the path of totality as you can, as it’s a rare event. Even if you can’t get to the path of totality, get out and watch a chunk of the Sun get eaten by the Moon. The sad part for me is that I won’t be able to view this wonderful event as I’ll be in Poland visiting family (which means I’ll have to wait until 2024 to view one; boo). However, there is something really pleasant coming out of my plight: I’d like you to send me your images, and I’ll feature them in a blog post about the Great American Eclipse! With your image, include the location and time of the shot, and please include the photo credit as you would like it to appear in the blog post. If you would like credits to lead to a website, Twitter account, etc, please include the link. Please remember to do this if you are tweeting the image to me as well! The blog post will go up shortly after the event, so get your photos to me ASAP! If you have photos you’ve taken of a previous total solar eclipse, check out my latest blog post on how to send those and be featured, too! You get photos and videos to me, and I’ll share them with the world! Happy viewing everyone! PreviousNASA Grant Opportunity for Women in the U.S.
NextAdditional Feature: Send Past Eclipse Photos to be Featured on my Blog!